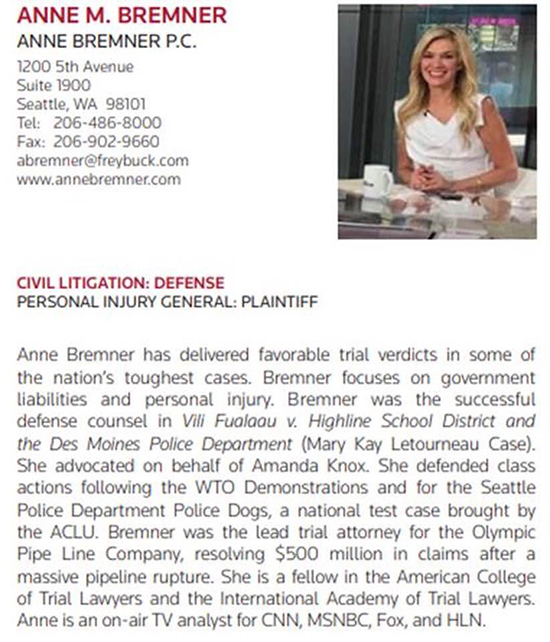 2018 Anne Bremner Named to List of "Top 10 Best US Criminal Defense Lawyers"
Highlight Hollywood – "Attorneys Anne Bremner and Gloria Allred, Both Named Victims Advocates of 2017"
Law Crossing – "Anne Bremner is One of the Best Trial Lawyers in the Nation"
Anne Bremner was selected as one of the top 100 lawyers in the United States by the National Association of Distinguished Counsel and is a "Founding Member of the Nation's Top Lawyers." 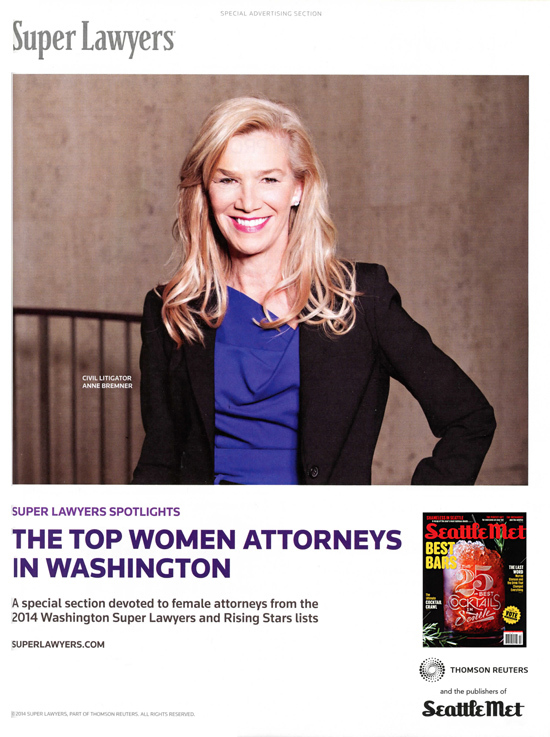 Super Lawyers July 2014 – Article about Anne Bremner "The Rock Star"
Super Lawyers July 2014 – "Top 50: 2014 Women Washington Super Lawyers – Top List by Super Lawyers"
Seattle University lists Anne among its "Notable Alumni"
Anne appears regularly on national news programs, and these appearances frequently are scheduled in response to breaking news. Follow Anne on Twitter to see her TV schedule. 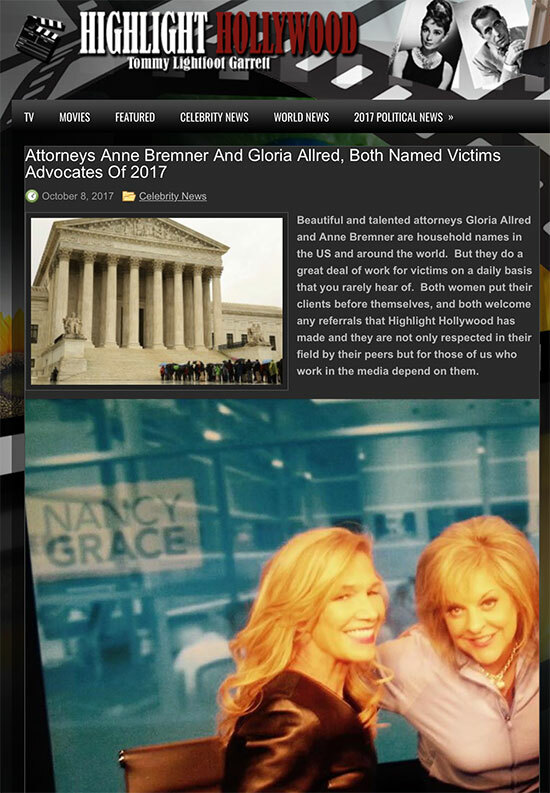 Anne named to Top 10 Lawyers List..
Anne named Victims Advocate of 2017 along with Gloria Allred. Anne talks about O.J. 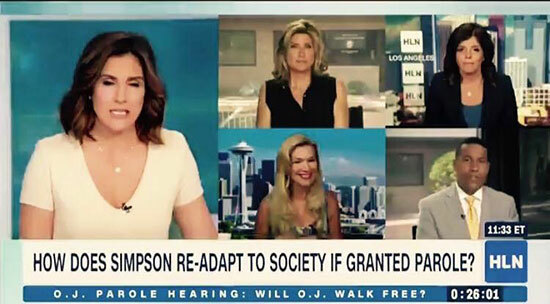 Simpson parole on HLN. 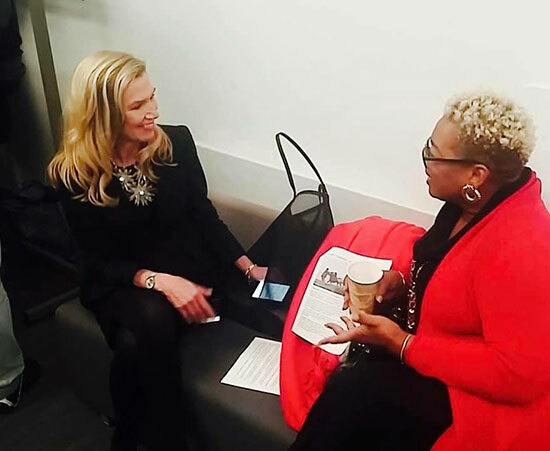 HLN with Anne Bremner on O.J. 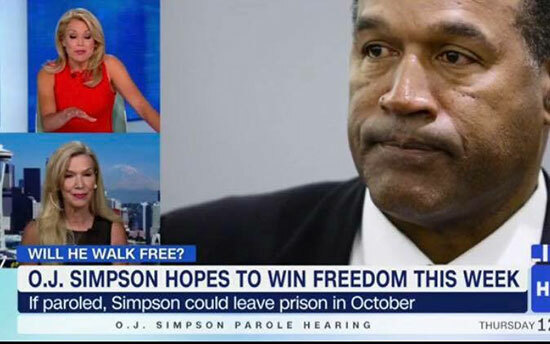 Simpson parole. O.J. 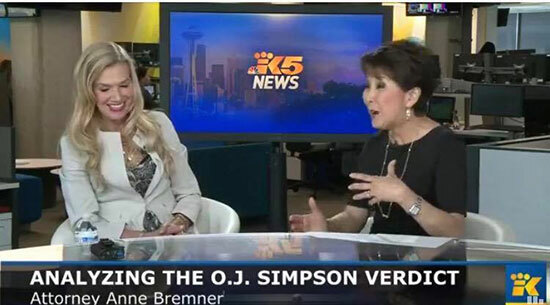 Simpson verdict on KING 5 with Anne Bremner. 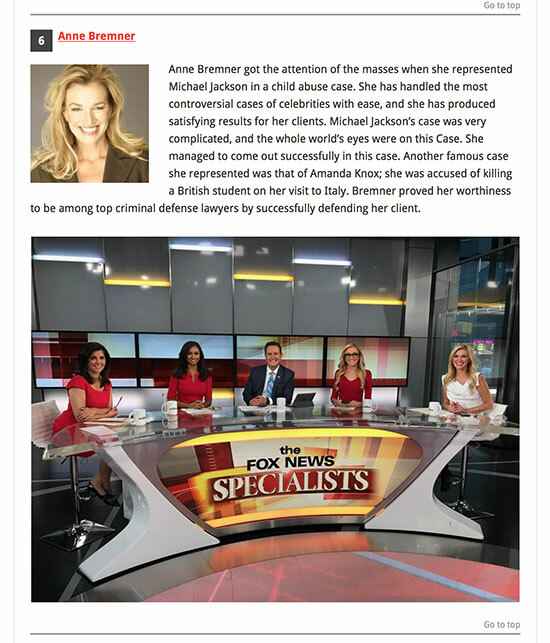 FOX News Specialist Anne Bremner. 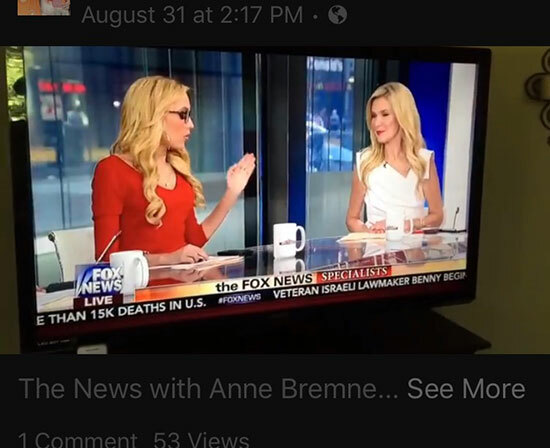 Anne Bremner as a FOX News Specialist. 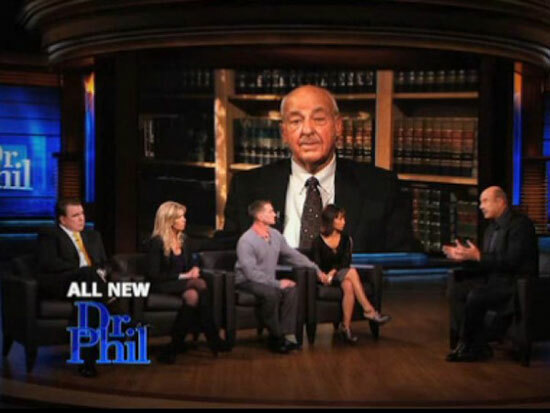 Anne Bremner on Dr. Phil Show. Anne Bremner on cover of Seattle Met magazine. 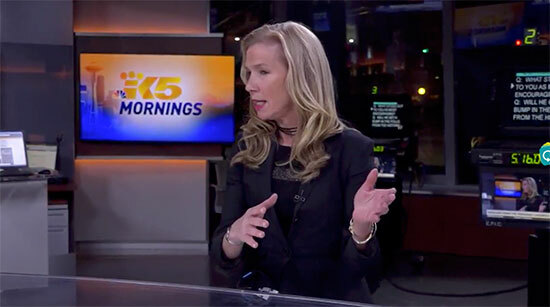 KING 5 Mornings hosted by Joyce Taylor, with guest Anne Bremner. Anne Bremner on the New Day program. Anne Bremner meeting with another guest. 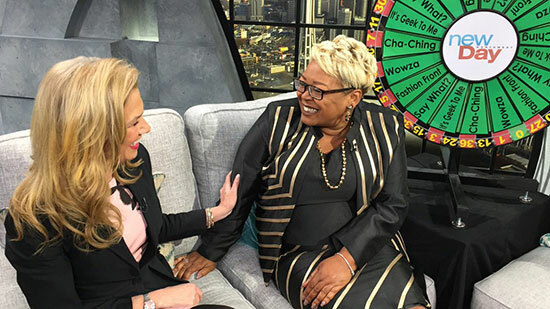 Anne Bremner as guest on the New Day program. Anne speaking at the Women Trial Lawyers meeting of the Litigation Counsel of America. 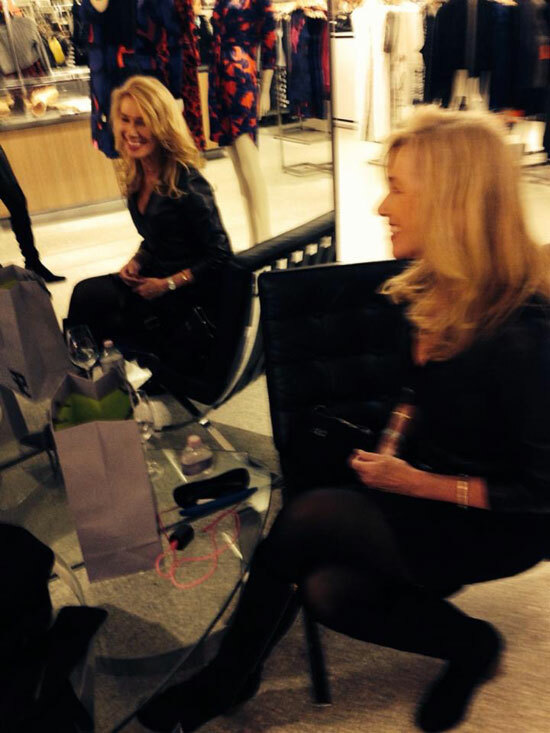 Anne at the Litigation Counsel of America. 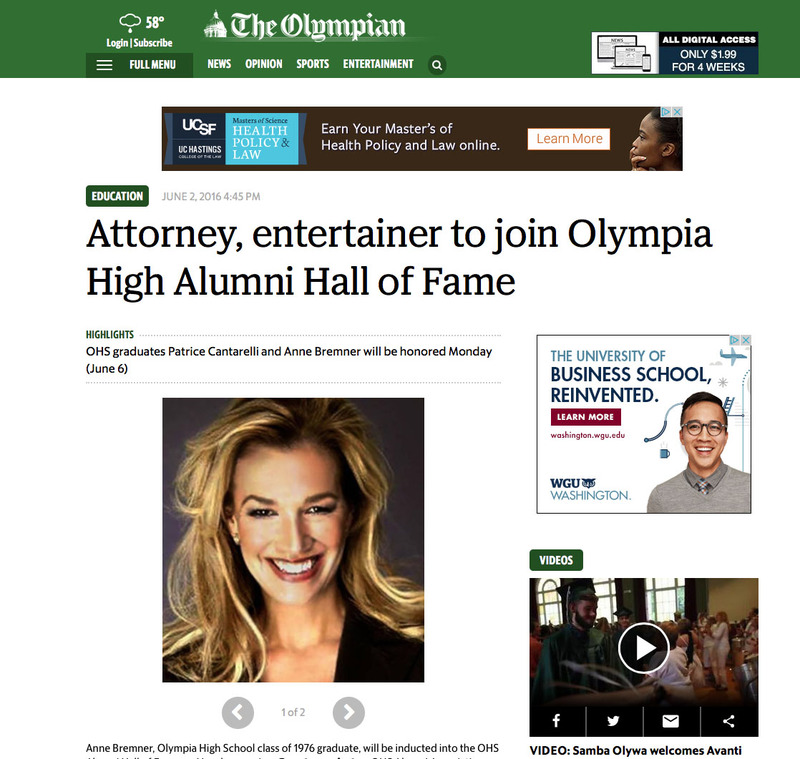 Click here to read the article about Anne's induction into the OHS Alumni Hall of Fame in the northwest newspaper The Olympian. 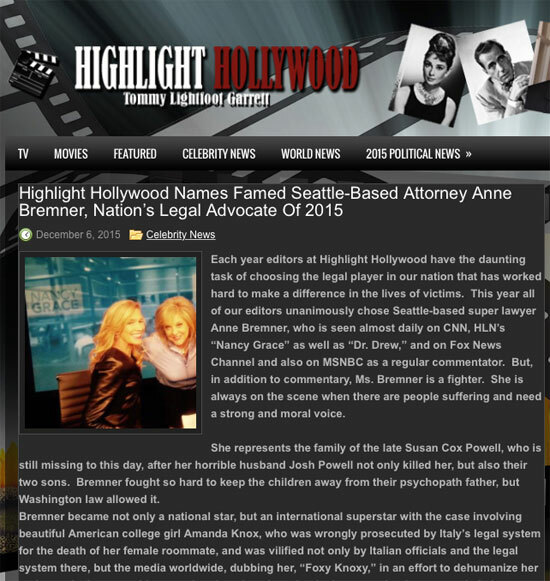 "Highlight Hollywood Names Famed Seattle-Based Attorney Anne Bremner, Nation's Legal Advocate Of 2015." 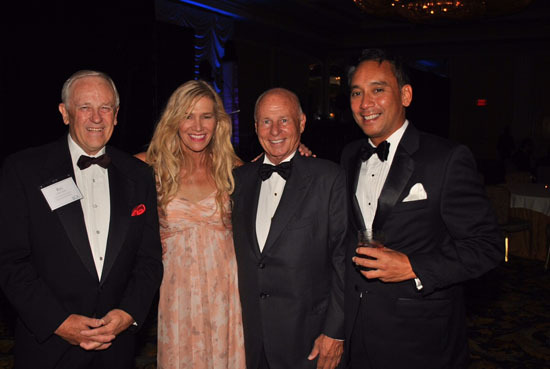 Anne Bremner at her 2015 induction into the Litigation Counsel of America. The Northwest Center Luncheon with Anne Bremner and Ted Buck. 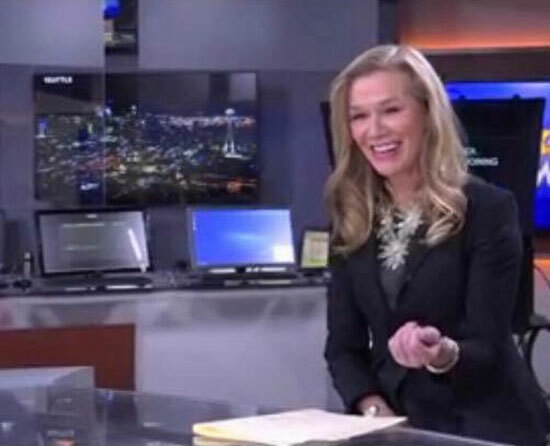 New Day NW on Seattle's King 5 TV on Halloween with Anne Bremner. 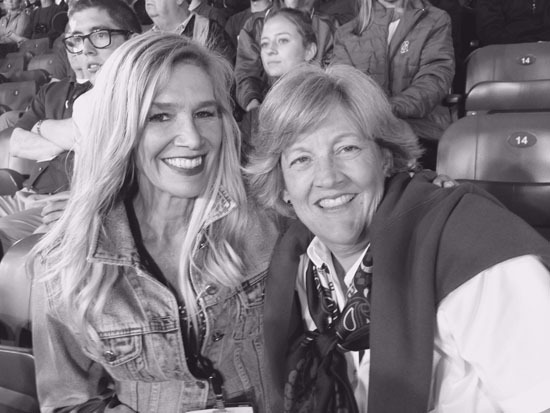 Anne Bremner at the game. 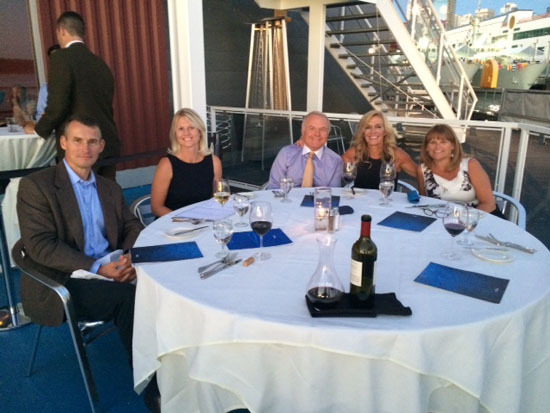 Anne Bremner was inducted into the prestigious Litigation Counsel of America. Anne Bremner was selected from tens of thousands, to be one of the Top 50 Finalists in More Magazine's models edition. 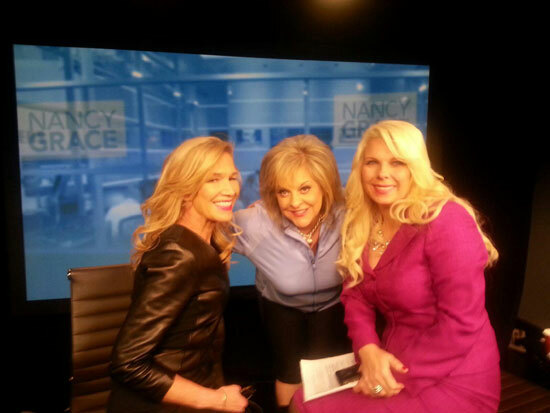 Anne Bremner on Nancy Grace HLN Show January 2015. 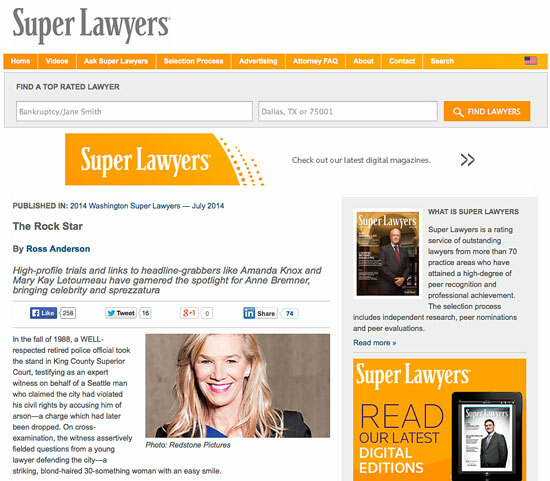 Click here to link to the "Rock Star" article about Anne in Super Lawyers magazine. 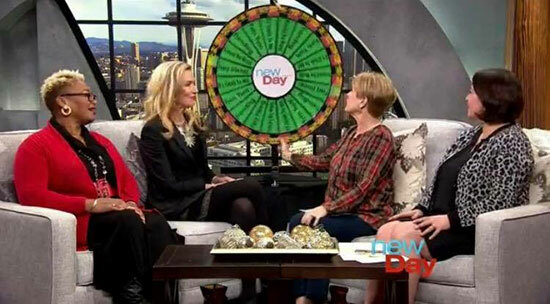 Anne appearing on the New Day show, KING 5 NBC, Seattle. Anne receiving the Trinity Praeses Elit Awards at Trinity College, Ireland. 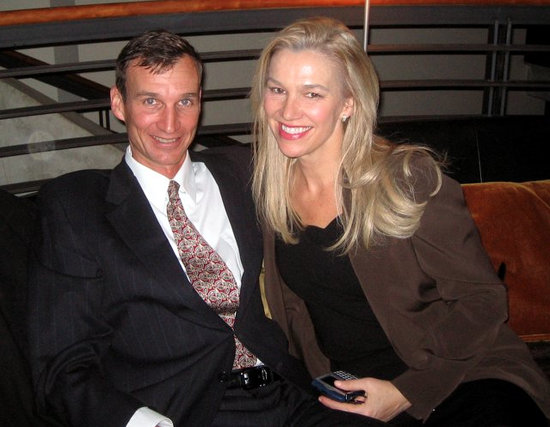 Anne Bremner with Brad Keller. Anne Bremner at Trinity College in Ireland. Anne Bremner with Ted Buck and others.